Did you Know About this Hidden Disney Fun? Hidden within the Disney parks are bits and pieces of magic often unseen by the masses of people running from one attraction to the next. However, if you spend some time looking at the details, you will find lots of exciting hidden Disney fun unexpected! Right along Main Street USA in the Magic Kingdom, you will find a statue of Goofy. He is sitting there on a bench seat waiting for you to sit down and take a photo with him. 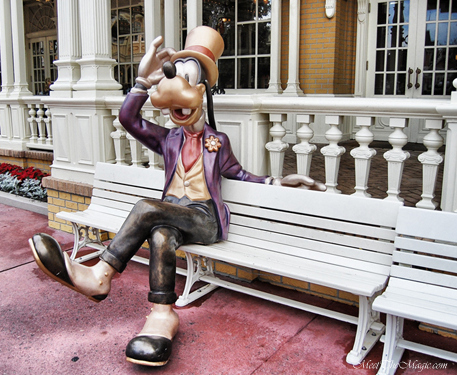 Be sure to sit next to him the next time you are in the Magic Kingdom and get a great photo! Also, tucked away on Main Street is an Alley. If you head down the Alley (found on the right as you walk from the entrance towards Cinderella Castle), you will find a variety of chairs and benches which are perfect for picnics or simply a short rest. But if you find the windows shown below, you can hear the performances of dancers and singers as they take their lessons from within. 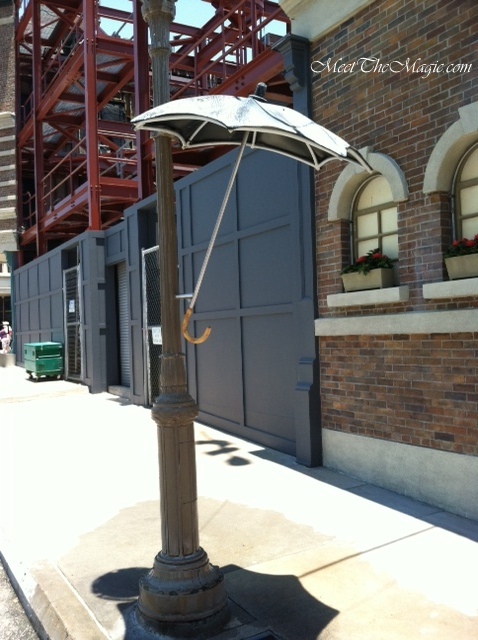 It is a nice extra touch added by Disney to bring more ambiance to the Alley! Changing parks to Hollywood Studios, make your way to the back streets entitled the Streets of America. Guests often simply rush through the Streets on their way to Lights, Motors, Action! and forget to take notice of the details found there. But on one corner across from the entrance to the Lights, Motors, Action! you will find this umbrella. Stand under the umbrella for a cute photo. Be sure to press the button so it rains and you can sing, Singing in the Rain! Be sure to visit here (Pirate Bootie) or here (Sword in the Stone) for more of my posts on Disney’s hidden fun! OK, how did we not know that the umbrella scene has rain?! We took pictures there just a few months ago and totally missed that! Love these ideas! The umbrella is great! The benches are very nice and close to meet and greet with Mickey and Princesses. Grab a FP sit down and eat and then go meet Mickey. How great! There used to be a lovely little white bench on one of the side streets off of Main Street, surrounded by flowers where my Mom had her pic taken sitting on many years ago. Then we as a family did the same in 1989 or 1992 and my daughter also did when she was there with band a few years later. It makes me sad that it is now gone. My picture of Goofy’s bench inspired me to do a treasure hunt scrapbook. This bench had the answer to one of the questions in the Passporter Treasure Hunts of WDW book. Since I had a picture showing the answer I decided to check other questions in the book & ended up with pictures to answer enough questions to fill a whole album. It’s one of my favorite scrapbooks.